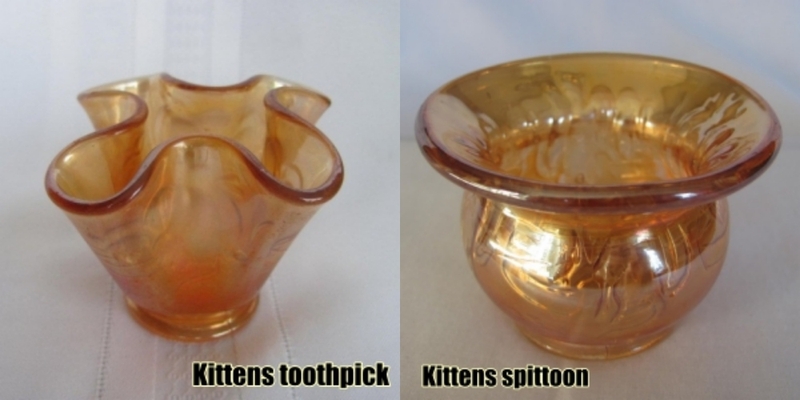 The Kittens pattern was advertised in the Butler Bros Catalogs in 1919 (a cup and saucer/plate were pictured). It is not known why some pieces have 2 sets of three kittens and others have 4 sets of three kittens. Although sometimes called a miniature, since there is no larger version of the pattern it is technically just a ‘small’. 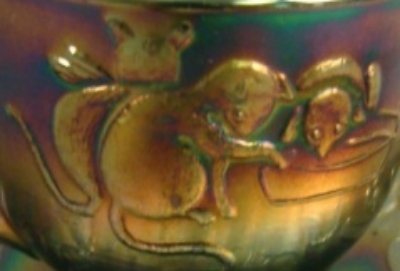 The pattern consists of 3 kittens, 2 to the left of a round deep dish (presumably filled with milk!) and one behind the dish with its face in as if drinking. 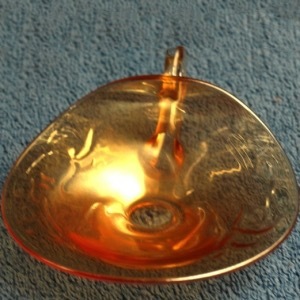 The shapes are all made from just 2 molds – the bowl and cup. 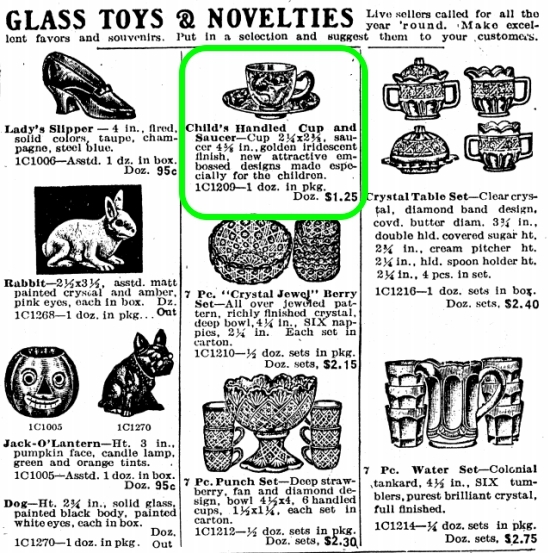 The cup mold was obviously used to make the cup used with the saucer in the advertisement in the Butler Bros catalog. 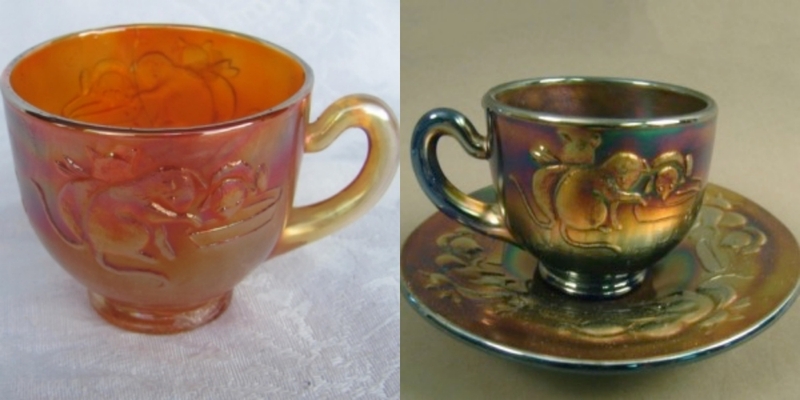 There is now a reported nappy (or pin tray) which was created by pushing the front of a cup down almost flat – definitely considered a whimsey. 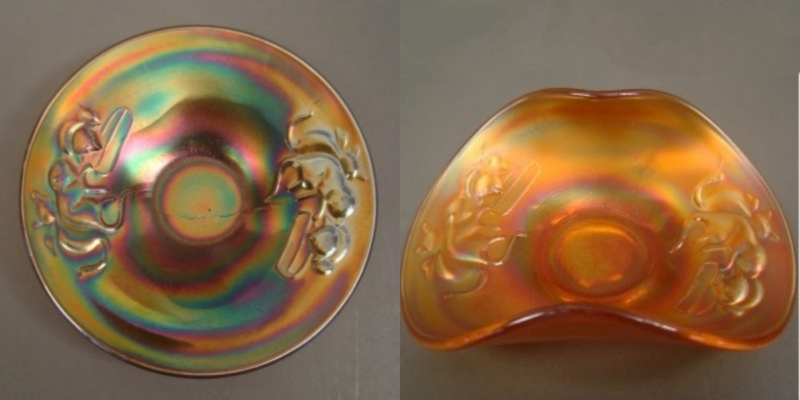 This pattern is most frequently found in marigold, it is also found in blue, a scarce amethyst, vaseline with a marigold overlay, aqua, powder blue with a marigold overlay and one white/clear iridized piece.